The days draw progressively shorter in the Northern Hemisphere until Winter Solstice on December 21st. As you might imagine, there are a number of traditions associated with this event that subsequently became part of the Christmas holiday celebration. Here’s a brief overview of Yule celebrations of past and present. The Norse god Odin was part of Yule celebrations that took place for three nights after the solstice. During the feasts, the first toast went to Odin to grant victory and power to the king, the second to Njoror and Freyr for good harvests and peace, and the third for the king. Presumably drinking and toasting went on for much of the night. The custom changed in the Tenth Century when Haakon Haraldsson, known as Haakon the Good, became king. Haakon grew up in Anglo-Saxon England, and returned to Norway as a Christian, a fact he kept secret until he became secure on his throne, at which time he passed a law saying Yule celebrations would coincide with Christmas when everyone was supposed to drink ale and keep the day as long as the ale lasted. This merging of holidays may be why Google defines Yuletide as an archaic term for Christmas. Now that mystery is solved, other Christmas customs and terms make sense. There is the YULE LOG — not the cake but the specially selected tree brought into the house to be burnt. 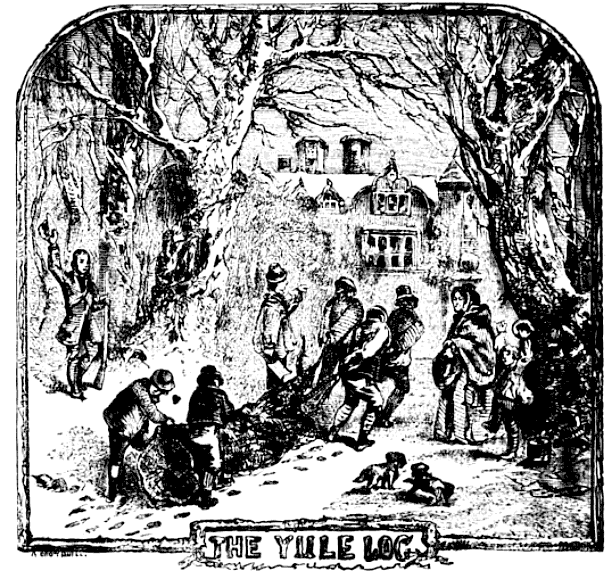 Yule logs predate Victorian Christmas trees by several centuries. 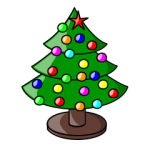 The largest part of the tree was fed into the hearth, with the remainder filling the room. Revelers kept feeding the log into the hearth so it would burn for the entire Twelve Days of Christmas. 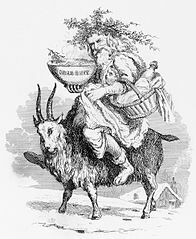 There is also the YULE GOAT, probably connected to Norse celebrations for the god Thor who traveled the sky in a chariot pulled by two goats. From this beginning, several customs emerged. In Norway people went door-to-door dressed like goats to sing carols in exchange for food and drink. In Sweden, Norway, and Finland elves rode goats to deliver gifts to children. When Scandinavians migrated to America, they brought Yule Goats, most often now viewed as Christmas decorations plaited with straw and tied with ribbons. The YULE BOAR is another pagan custom we’ve incorporated. Yule Boars probably began with the Anglo-Saxons. 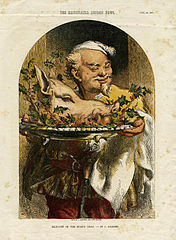 On Yule Eve the best boar in the herd was brought into the Banquet Hall. Participants laid their hands on it and made unbreakable oaths which were thought to go straight to Freyr, god of Yule and fertility. The next day, the boar was sacrificed to Freyr. Servants carried the boar’s head with the apple in its mouth into the banquet hall to the sounds of trumpets. And the feast began. Some say this custom explains why many people eat ham on Christmas Day. The last Yule custom for today is YULE SINGING better known as WASSAILING. Wassail itself is a beverage made from mulled ale, curdled cream, roasted apples, eggs, cloves, ginger, nutmeg, and sugar. The hot mixture is served from large bowls. As the drinks are passed around, the giver says, “Waes Hael” which translates as Good Health. If you want to make your own Wassail, here’s one recipe. Wassailers sound a bit like Norwegian carol-singing goats. Wassailers also go door-to-door singing in hopes they will be asked inside for a bit of wassail, a bite to eat, and some time by a warm fire. In Victorian times, Wassailers morphed into people going door-to-door singing Christmas carols. So now you know how St. Nicholas became Santa Claus; how Yule became Christmas; how Yule Boars became Christmas ham, and how Wassailers turned into Carolers. I don’t know how the Yule Log became a round cake. I’ll try and find out for next year. HAVE A WONDERFUL CHRISTMAS, AND I’LL BE BACK NEXT MONTH. Illustrations in the Public Domain from Wikimedia Commons. Hauling in the Yule Log for Christmas. 1864. Father Christmas on a Yule Goat. Slaughtering the Sacred Boar. Yule-the Midwinter Festival. Orkneyjar. Mark Mancini. The Fiery History of Scandinavia’s Yule Goat. Mental Floss. Dec. 19, 2013. 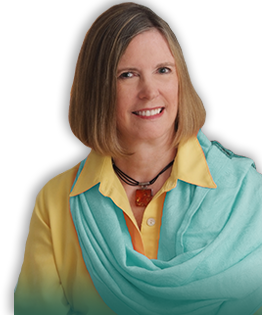 Sue Weaver. The Yule Goat. Inside Story, Dec. 18, 2009.